There could be only one subject for this monthly update: HR1. 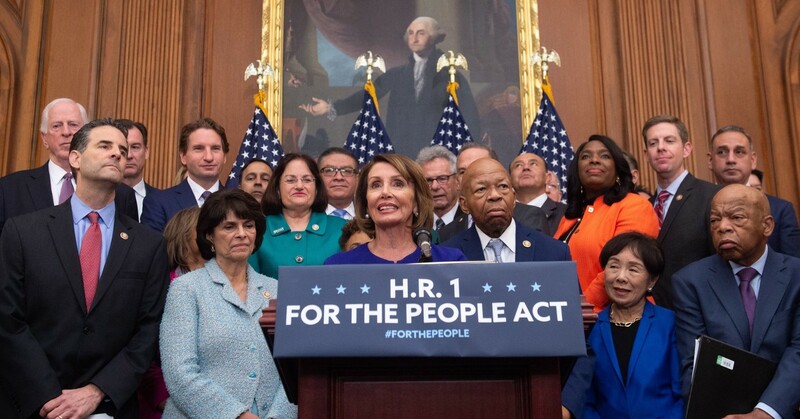 As I’m sure many of you saw, the House of Representatives passed the most important (small d-) democratic reform package in fifty years — with public funding for congressional campaigns, gerrymandering reform, automatic voter registration, and strong new ethics regulations to govern Congress. The bill is an astonishing reaffirmation of the basic commitment of a representative democracy. And that it passed and was made a priority marks enormous progress in our fight. Because some of you will remember what was called a quixotic campaign just four years ago: When I decided to try to make reform a central issue in the 2016 presidential campaign, I was convinced by many that the only way to fix this democracy was to bundle many reforms into a single package. Mine was close to HR1 — HR1 is stronger in some respects (automatic voter registration), and less ambitious in others (vouchers would be an even better public funding mechanism). But many didn’t see the need for the bundle, and few saw the need to make it a priority. Obama signaled the importance of a bundle in his final speech to the nation; he also signaled its importance. It is so incredibly encouraging to see the party follow his lead, and propose a series of changes that if enacted would move us far down the road to a representative democracy. The real hero in this story is Congressman John Sarbanes (D-MD). I met Sarbanes for the first time just after my book, Republic, Lost (2011), was published. He was at that time just beginning to think about how to make reform possible. For many years, he worked to craft the core (and most important, in my view) reform in HR1 — public funding for congressional campaigns. And his team has worked tirelessly to convince the Democratic leadership to take the bill up, and to make it a priority. the legislation was not crafted with any input from Republican lawmakers, and while it has the support of the entire House Democratic caucus, not a single Republican co-sponsored or voted for it. Leadership is more than the art of devising good ideas. It also entails building coalitions around solutions so they can be turned into reality. The public is sick of “messaging bills” and symbolic maneuvers the two parties keep devising to try to jolt their bases or corner the other party into looking bad, all just to win a few competitive seats every two years. I don’t think this is fair. Nick knows that Sarbanes has worked tirelessly to recruit Republicans to the cause of reform. And while groups like Represent.US and Take Back Our Republic had found in the states plenty of grassroots Republicans keen for reform, DC Republicans have united against the idea of equal citizenship. Not a single Republican voted for this reform package, and Senate Majority Leader Mitch McConnell vowed to block the bill from even getting a vote in the United States Senate. There comes a time when we have to tell it like it is. DC Republicans are not reformers. That’s not to say that Republicans are not reformers. It’s not to say that conservatives are not reformers. But rather than pretend that this is a problem of process — of failing to “craft with any input from Republican leaders” — we should state openly: there was plenty of “input” from Republican leaders. That input was clear: No way. This is a hard truth to acknowledge, but we should acknowledge it and figure out how to address it. This is not the only failure of leadership in the DC Republicans today — even if, in my view, it is ultimately a much more significant failure. What must happen now is for Republicans in the states to begin to elect Republicans to Congress who can begin to say openly and honestly that they too want to reform this corrupted democracy, by assuring that every citizen is represented equally. That may well be, as Mitch McConnell called it, a “power grab.” But it is a small-d democratic power grab — for a democracy, not for one party. The Democrats in DC have done their part. It is now on all of us — not as Democrats, or as Republicans, but as citizens — to rally America to elect a Congress that could now carry through. That will only happen — and should only happen — if Republicans are part of the mix. It is time for those reformers to step up. This blog post was adapted from Lessig’s monthly email update. To receive these emails, click here.